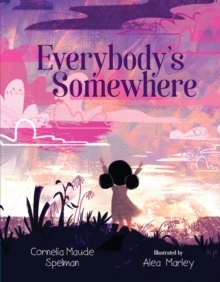 Selected for Notable Social Studies Trade Books for Young People 2018 by NCSS-CBC, a cooperative project of the National Council for the Social Studies and the Children's Book CouncilEverybody's somewhere, where are you?I'm right here, I'm somebody, too. Some are in the country, some are in the town. Everybody's somewhere, up or down. Everybody-moms, dads, grandpas, grandmas, friends, and people you've never met-is somewhere in the world, doing something right now, even if you can't see them. Everybody's Somewhere is a fun, colorful introduction to the idea that everyone you've met, or haven't met, is somewhere. Written perfectly for young minds that might not fully comprehend how big the world is, or the number of people on it, this fun children's book will plant the seeds of the ideas in their minds. With its playful poetry, bouncy rhymes, Everybody's Somewhere asks children to expand their perspective, and follows-up with fun illustrations. Award-winning author Cornelia Maude Spelman invites children to imagine other people in other places doing different things, to be delighted by new ideas, and to be reassured that everyone is important and sharing the same world.